You are here: Home / FAQ / What is furigana (ふりがな)? Furigana 振仮名 indicate the correct pronunciation of Japanese kanji characters. In principle they consist of Hiragana or Katakana which are written next to the Kanji. At Nihongo Ichiban we decided to use Hiragana only since most foreigner are more familiar with these. What’s the differences between furigana and kana ? Are there differences? 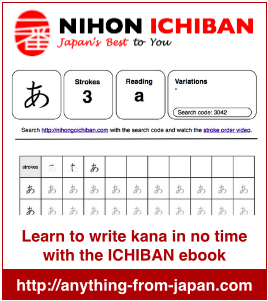 When people use the word “kana” they usually refer to Hiragana and Katakana as a category of Japanese characters. The word Furigana when describing the reading of a kanji or a combination of multiple kanji.